Some sections of our system require that you allow popup windows. (ex. Entering help time preferences). 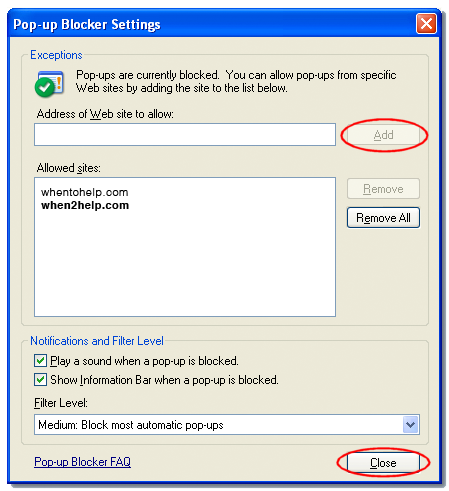 If you are having trouble entering preferences or if your computer makes a beep or sound that indicates that popup windows are being blocked, you can either turn off your popup blocker or set your blocker up to allow popups from our web site. or this icon on the status bar (at the bottom of the browser window), Internet Explorer has blocked a pop-up window. Follow the instructions below to unblock it. If you see this icon in the toolbar below the address bar, one of Internet Explorer's plugins (such as Google or Yahoo toolbar) has blocked a pop-up window. Follow the instructions below to unblock it. This will make Internet Explorer save the WhenToHelp.com web site in its list of Allowed Sites so that in the future all pop-ups from WhenToHelp.com webpages will be displayed. If the pop-up window is still being blocked, check that it's not being blocked by one of Internet Explorer's plugins. If the popup window is still being blocked, check that it's not being blocked by Internet Explorer itself. In the field titled Address of the website to allow, type WhenToHelp.com and click the Add button. The WhenToWork.com website should now appear in the list of allowed sites as shown below. The WhenToHelp.com website will now be saved to your list of Internet Explorer Allowed Sites for pop-up windows. Unfortunately, setting the Internet Explorer preferences to allow pop-ups from a site will not guarantee they will always be displayed. If you have an Internet Explorer plugin installed which is blocking pop-ups, it will need to be configured separately as shown above. This indicates a pop-up has been blocked by Firefox. Follow the instructions below to unblock it. This will make Firefox save the WhenToHelp.com web site in its list of Allowed Sites so that in the future all pop-ups from WhenToHelp.com web pages will be displayed. In the Address of web site field, enter WhenToWork.com and check Allow. The WhenToHelp.com website should now appear in the list of allowed sites as shown below. This will make Firefox save the WhenToHelp.com web site in its list of Allow Sites so that in the future all pop-ups from WhenToHelp.com will be displayed.